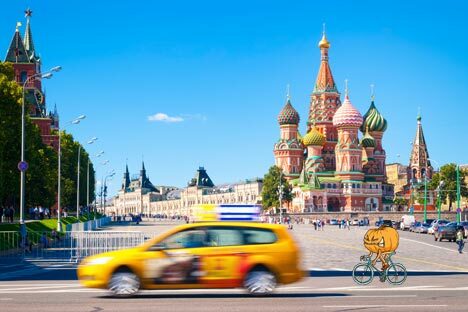 Those who drive the capital's trams, taxis and limos explain why the traffic situation in the Russian capital is so bad. Who drives Moscow’s trams, taxis, limos and rickshaws? What does the Russian capital look like to these drivers, and what are the main problems on Moscow’s roads, in their opinion? Ogonyok magazine tries to answer these questions. “I have been driving a marshrutka [a small and nimble minibus that has largely replaced the traditional city bus in Russia] since the 1980s,” Osman says. “But I moved to Moscow only a few years ago. I come from Bishkek, Kyrgyzstan. The money I was making back home was not enough, so my wife sent me to Moscow. I was a driver in Bishkek, but I would sometimes also sell fruit at the market as a second job." Osman is confident that migrants drive more carefully than native Muscovites. “Our company has huge fines for traffic violations; nobody wants to lose half their wage. The work is very hard. I sometimes have to work 15-hour shifts. There is not enough time even to have a proper lunch,” he says. “I bring a lavash [flat bread] to work and eat right at the steering wheel. The owners of our company are native Russians. All the drivers are migrants from Kyrgyzstan, Tajikistan, or Moldova. I've never met a native-Russian marshrutka driver. None of the Russians would want to work in such conditions." Osman says that he is worried about the new Russian law that will require him to obtain a Russian driver's license. He fears that he will have to go back home to Kyrgyzstan once the law comes into effect. “I have been working since 2001, when limos were still a novelty in Moscow. In the 1990s, there were only one or two limos in the whole city. Now I reckon there are 2,000–2,500,” Alexei says. He chose the profession precisely because limos were still drawing stares back at the time. Alexei says that limos also get into traffic accidents sometimes and, because of their length, they drive more like a bus than a car. “I have been a rickshaw driver since May,” Anton says. “Frankly speaking, I am not a good cyclist — my coordination isn’t good enough. But the rickshaw doesn’t require any great cycling skills; it is, after all, a hybrid of a bicycle and an electric car. We now ferry customers only along the embankment in the city center. But, in the summer, we can drive to any destination in the city, just like a proper taxi." Anton says many of the traffic accidents in Moscow happen because of the motorists from other parts of Russia. He also believes that the infrastructure for cycling in Moscow is not all that it could be. “The city needs more cycling lanes. It also needs more bike cabs. They are very popular in other parts of the world. I once had a customer from New York; she told me that their bike cabs charge about a dollar per kilometer. Our tariffs are 10 times as high,” says Anton. Vera says the main cause of the traffic jams in Moscow is poor time settings on traffic lights. “I hold a cab license, so I work for myself," Yuri says. “At first it was just a way of making some extra money in addition to my day job. I would pick up passengers on my way home or to the office. But then I became a full-time cabbie. I now even have some leisure time after work. Of course, I sometimes return from work very tired after all this driving. But there are more pros than cons to this job. I get to talk to lots of people, and I get to see the city." Yuri argues that most of the traffic accidents in Moscow are the fault of inexperienced motorists. Yuri also believes that there are not enough pedestrian crossings in Moscow.